Whilst this python guitar isn't something that appeals to me personally, even I have to admit that the creators, Xentric guitars, have done a first class finishing job on it. As to how it actually plays, I couldn't comment. And at least the snake theme isn't such an appalling cliché in hobnailed boots as a guitar with skulls all over it. As you can see it's very smooth and shiny... possibly a little too glossy? It's a pity about the generic Strat-type neck. It would have been nice if the headstock design could have continued the snake motif in some way. Also, as such a lot of work has obviously been put into this guitar, it amazes me that the string ends haven't been clipped up at the tuners. They've gone to the bother of fitting coloured strings, so I'd have thought that presentation was an issue. Currently listed on eBay with a starting price of $999.95. Why've I got that Motörhead song "Love Me Like A Reptile" going through my head? 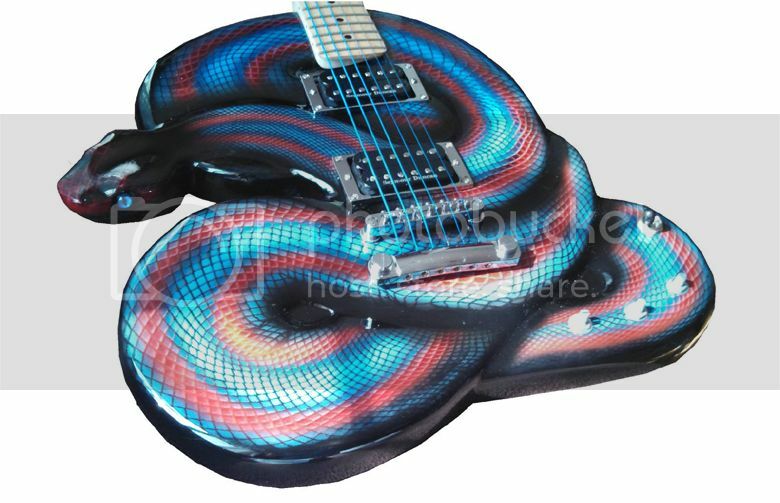 I must say that compared to some other "snake" guitars I've seen, this one is almost esthetically pleasing. Not quite, but almost. It is very well done , I feel the same about things like this as you do though. If you liked our work then come check out xentric guitars.com now. We are taking away the cookie cutter mold of normal guitars.